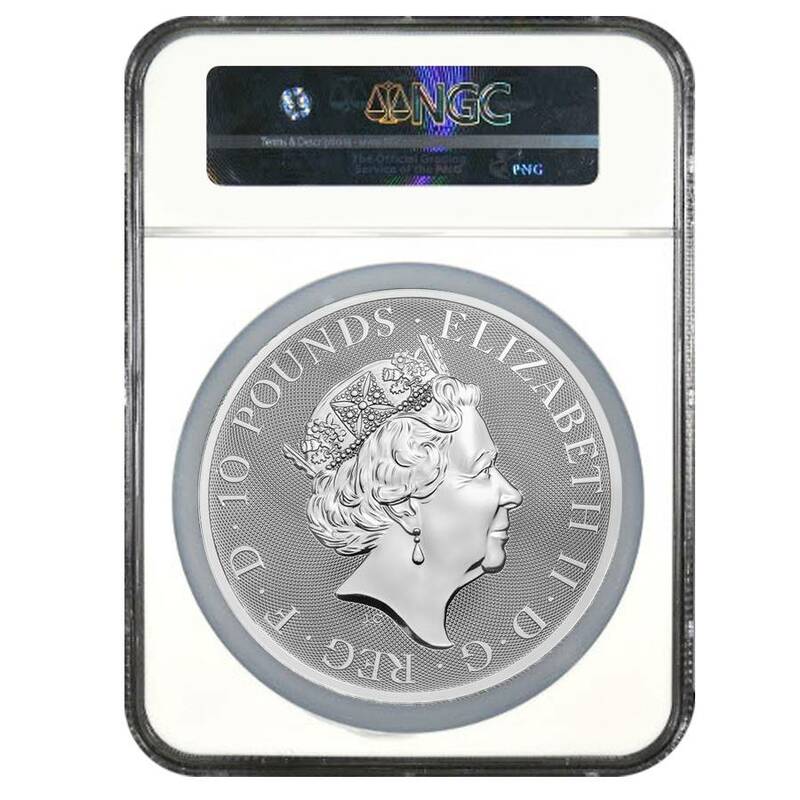 The highly anticipated new release of the Queen’s Beasts series, the 2018 Great Britain 10 oz Silver Queen's Beast (Griffin) Coin NGC MS 70 ER is now available through Bullion Exchanges. The Queen's Beast program features the ten beasts that stood at the Queen’s coronation and each beast supports a badge of arms of a family associated with the ancestry of Queen Elizabeth II. The first issue was followed by the “Griffin of Edward III” and the “Red Dragon of Wales” coin, and the mint will also feature the Black Bull of Clarence, the Falcon of the Plantagenets, the Yale of Beaufort, the White Lion Mortimer, the White Horse of Hanover, and the Unicorn of Scotland. 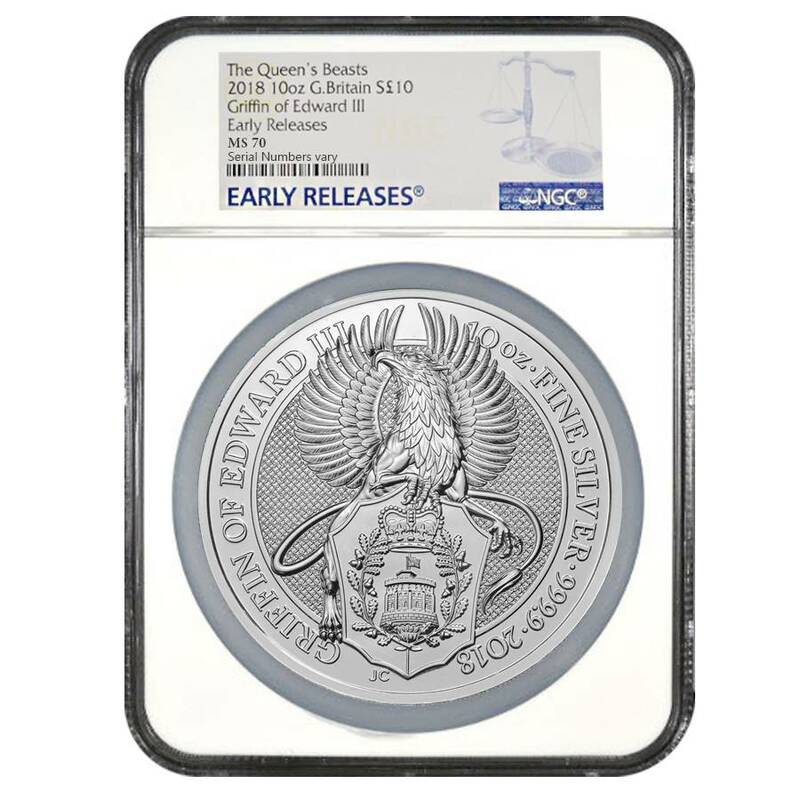 Designed by Jody Clark, the coin's reverse depicts a stylized image of the Griffin of Edward III. The Griffin is the king of beasts two times over, as it has the body of a lion and the head of an eagle. This stunning coin was authenticated as nearly flawless and earned the highest MS 70 grade from the Numismatic Guaranty Corporation (NGC). Made from .9999 pure silver, with a weight of 10 oz. Struck by the British Royal Mint. NGC MS 70 - Coin with no post-production imperfections at 5x magnification. Coin comes in NGC holder with Early Release label. Obverse: Showcases the effigy of Queen Elizabeth II. Inscriptions: “Elizabeth II”, “D.G. REG F.D” (Queen by the Grace of God), and the denomination. 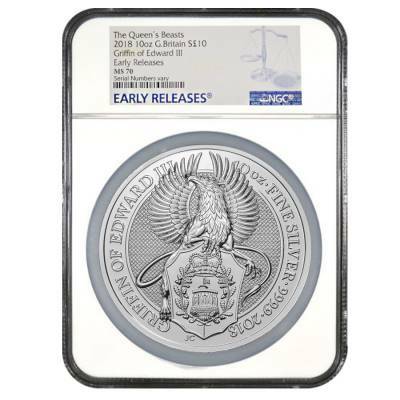 Reverse: Features a stylized image of the Griffin of Edward III. Inscriptions of “GRIFFIN OF EDWARD III”, JC in reference to the designer, and the weight, purity, and year of mintage circle the edges. Bullion Exchanges offers you a wide selection of exclusive items from renowned international refineries. Add this magnificent coin to your collection today, and it will be carefully wrapped, packaged, and delivered to your address. If you have any questions, just call us at 800.852.6884, or send us a message, our customer service representatives will be happy to assist you. For every $1 spend, you will earn 1 Bullionaire Buck which is equivalent to $0.001 off a future purchase. 501 BB = $0.50.